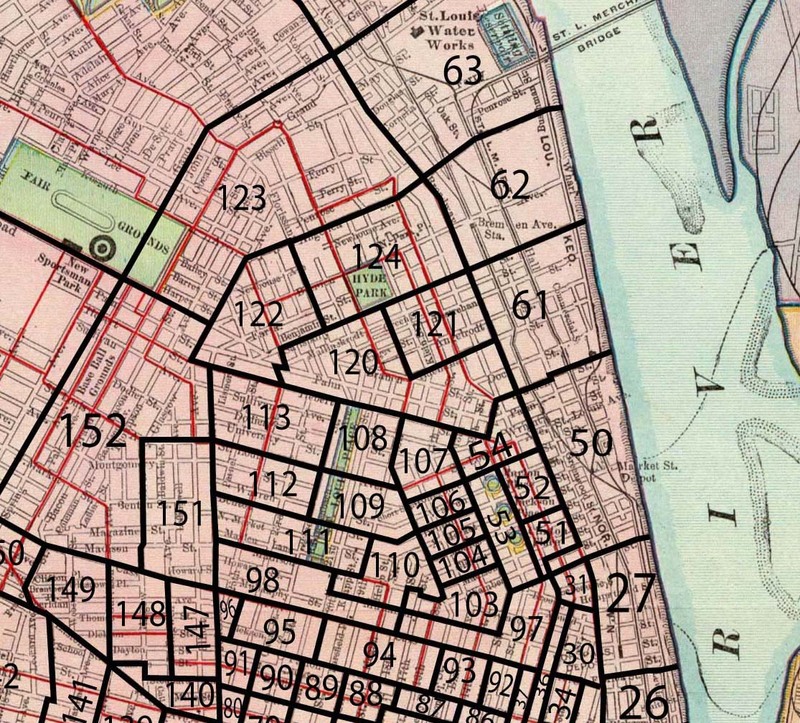 The descriptions of most enumeration districts are short, simple lists of the streets bounding the districts, or they name the streets used to divide a ward or precinct. For example, the boundaries of EDs in St. Louis could be drawn directly onto a georeferenced historical street map, as illustrated here. To add these boundaries to a contemporary TIGER file required first that we establish the actual 1880 boundaries of the city. We began with the county-level boundary files developed the National Historical GIS Project. Some large cities occupy their entire home county or counties (Philadelphia, New York City, Baltimore, and St. Louis). Others occupy some portion of a larger political entity, and our task was to identify this area. 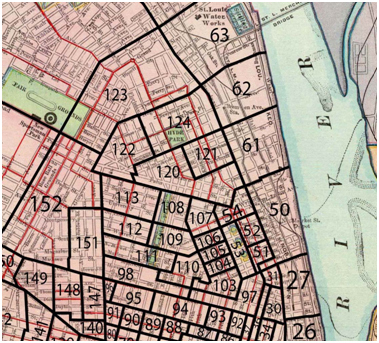 The current city boundary is a useful reference when the city has not annexed large areas since the 1880 census. In most cases, though, the outer boundaries had to be approximated using a carefully georeferenced historical map combined with modern details such as street and rivers. The resulting TIGER-referenced city area was divided into EDs following the description of street boundaries. However in this case instead of following street on a historical map, we used contemporary TIGER street lines and water features. Sometimes, as when there was no TIGER line to identify a boundary, the boundary was drawn as an approximation.